Anvita Bajpai is a writer who has published research papers, filed patents, and written business and technology articles, and has been invited as a speaker at conferences such as UXINDIA (2013, 2014), WIAD 2015, Developer Summit 2015 and RSD 2016. 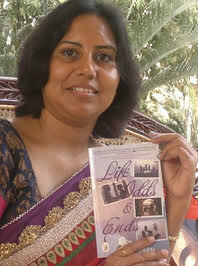 She is the author of two books, Life, Odds and Ends and Turning Points of uncommon people. Anvita Bajpai sued Chetan Bhagat, claiming that the ‘characters, places and emotional flow of his book, One Indian Girl, had been lifted from one of her stories ‘Drawing Parallels’ from Life, Odds & Ends. A civil court in Bengaluru granted temporary injunction, on April 19, 2017, restraining Bhagat and Rupa Publications from selling the novel. Life, Odd and Ends is a collection of four short stories that examine relationships bravely and, on occasion, stirs up one’s heart strings. Clearly the author, Anvita Bajpai, is a very intelligent person, very observant, and a keen student of the subtleties of human emotions. Her stories have a strong foundation and brings out the rich tapestry of human relationships. Of the four stories, two are top class, two that could have been top class but for some sloppy editing (no fault of the author). Perhaps the most powerful story in the book is the first one “Drawing Parallels”. This examines the complexities and subtleties of relationships between man and woman in a marriage. The story line has tons of depth and encourages the reader to look beyond the superficial. Aliya, the protagonist in “Drawing Parallels” is trying to adjust to her family when memories of first boyfriend surface. They had a great time together. Their separation and her relocation lead to emotional turmoil. This is followed by a narration of her second romantic relationship, again in flashback. This, too, did not lead to marriage. Both stories end at one of the seven wonders of world, where Aliya tries to balance of various aspects of her life – in the company of a third boyfriend. The last story, “My World” could have been a masterpiece – the word “could” says it all! Such a strong story. Such potential for touching the reader from various angles. Such immense potential. Who is at fault? Partly the author; tenses are mixed up, there is confusion singular and plural usage . These laxness tends to distract from a top class story! In spite of these shortcomings, Anvita is a good story teller – PERIOD! The second story, “Soul Mates,” is touching; the literary license employed by the author completely acceptable. We all look for psychic connections, however questionable they may be. Once again the editing should have been better. How can one overlook Mira (the protagonist) from being spelled Meera in the very next line?. The third story, “Context,” is based a strong premise but, in my opinion, falls short of its goal on account of some jarring parts in the narrative. As a graduate from one of the Ivy League institutions, the author does have striking concepts. She compares an unfulfilled relationship between a husband and wife to an entrepreneur seeking investments from a venture capitalist. She compares the difficulties of letting go of hurt in relationships to a stack (a data structure in computer science) and its LIFO access method. She draws analogies in human relationships marriage to HR terminologies. Anvita is fundamentally a creative author for sure. So why does her writing that draws such criticism? The sloppy editorial team! I sincerely hope that she moves on to a more conscientious publisher. You deserve better.